BANGKOK, Oct 16 – The 34th Bangkok International Gift Fair and Bangkok International Houseware Fair, BIG & BIH October 2012, kicked off on Tuesday, with deputy commerce minister saying the event would help generate over Bt300 million in circulation. Deputy Commerce Minister Poom Sarapol presided over the opening ceremony, saying the lifestyle products industry continues to bring in revenues to the country with continuous growth every year with the United States, Britain, Germany and Japan as Thailand’s main trading partners. Over 600 Thai, ASEAN member country and other interntional entrepreneurs are participating in the fair, which is expected to draw more than 100,000 Thai and foreign visitors shopping for gifts and home decor items. Mr Poom said that although the export performance of lifestyle products in the first eight months of this year was at minus 3 per cent, he was confident that the last quarter would see a positive figure, as it is a gift-giving season. The export sector would then see a 4-5 per cent expansion, or around Bt100 billion in value. The deputy commerce minister said there was also an agreement to found an ASEAN gift association signed by three parties — the Thai Gifts Premiums & Decorative Association, Malaysian Gifts & Premium Entrepreneurs Association and the Gifts Association Singapore. The new group is to create higher trade value among member countries and to create bargaining power with countries outside ASEAN. The other seven nations are expected to join the club by next year. 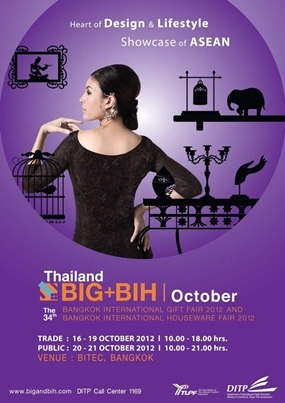 The BIG & BIH October 2012 is held through Oct 21 at Bangkok International Trade & Exhibition Centre (BITEC), Bangna. The first round on Oct 16-19 is for business partners’ negotiations. The second retailing round open for the public is this weekend, Saturday and Sunday Oct 20-21.